An 11-year-old perfectly happy and healthy cat that was to be put down was saved from death’s door after a bank asked a judge to block the action. Why was the cat to be euthanized? Her late owner requested so in her will. 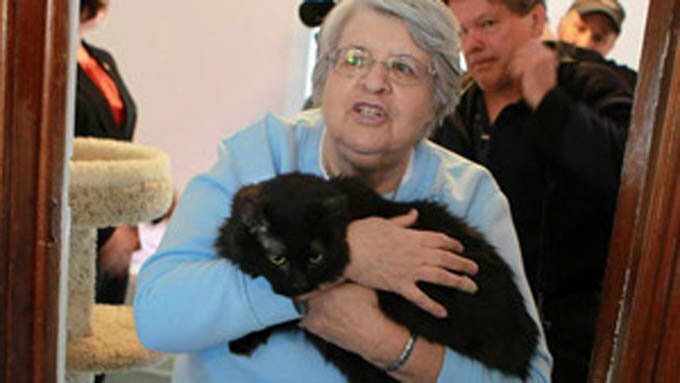 When Georgia Lee Dvorak of Berwyn, a western suburb of Chicago, passed away in December of last year at age 76, she previously arranged for her $1.3 million estate go to animal-related charities. She also wanted Boots euthanized “in a painless and peaceful manner” via lethal injection. According to Dvorak’s neighbor, Sandra Buturusis, Boots’ owner was an avid animal lover, and her last request for her cat wasn’t without a reason. According to Buturusis, Dvorak told her that Boots’ previous owners mistreated the cat by throwing her down stairs and locking her in a closet for days at a time without food, water, or a litter box. Eighteen months before Dvorak died she rescued Boots, who was a stray at the time. Dvorak had no family or relatives. The Fifth Third Bank, the executor of the will, asked a judge to block Dvorak’s wishes. Attorneys on behalf of the bank claimed it was a “violation of public policy to euthanize a healthy housecat where an appropriate shelter has been identified,” and cited court precedent from other states, including Pennsylvania and Vermont. “We brought a petition asking that the language be set aside or stricken,” Fifth Bank Senior President Jeffrey Schmidt said. “We didn’t want to euthanize this healthy, living animal.” Schmidt suggests people create a separate trust for their pets. The court ordered that Boots be adopted by a home with a track record for giving loving care to animals. The feline now lives at the Cats-Are-Purrsons-Too no-kill animal shelter. Dvorak’s will that was drawn in 1988 contained the provision that “any cat or cats she owned at the time be euthanized.”People often create special provisions for their pets as part of estate planning.